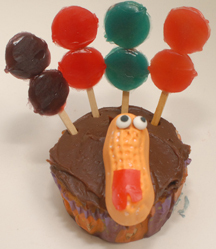 Use this turkey as inspiration for your own cupcake design. We used Fruit Roll-ups brand “Stackers” and craft sticks for the feathers; you could try fruit leather and toothpicks, or fondant and bamboo skewers, or whatever you have on hand. What You Need: 1 cupcake (baked and cooled); chocolate frosting; circus peanut; bit of red fruit roll (for wattle); candy eyes (or just use black writing icing); thin craft sticks or skewers; Fruit Roll-ups Stackers. Make That Cupcake! : Frost cupcake with chocolate icing. Using dabs of icing, stick candy eyes to top of circus peanut. Using clean scissors or knife, cut fruit roll into shape of turkey wattle and stick to bottom end of circus peanut and place peanut on cupcake. Stack Stackers on top of each other with craft stick or skewer between them. When you have as many as you’d like, stick them into cupcake for feathers. This entry was posted on Monday, November 5th, 2007 at 4:00 am	and is filed under Thanksgiving cupcakes. You can follow any responses to this entry through the RSS 2.0 feed. Responses are currently closed, but you can trackback from your own site.